Friends of the Amador County Library provided funding for this innovative DVD storage and retrieval system allowing people to easily access the main library's collection of 1,742 DVDs, including adult/teen and children's, drama and non-fiction titles. Previously, each DVD case was placed on shelves for display. however, the discs themselves are not kept in the cases. 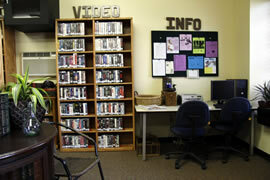 To check out a DVD, an individual would bring the empty case to the desk and staff would go to the file drawers and pull the corresponding DVD. Getting the DVDs shelf-ready was an extremely lengthy process - not only cataloging, labeling and-stamping each case and DVD but also making up individual protective sleeves for each corresponding DVD case. As as you can imagine, this method was both time consuming and subject to error. 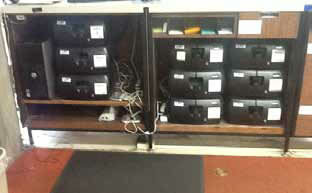 The Friends purchased nine LAT Stena DVD dispensers, which now house the majority of the main library's movie collection. Each pod holds 150 DVDs. The pods automate the process of locating and dispensing the DVDs, which improves the efficiency of the service and frees up staff time for other duties. 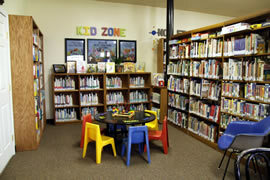 Friends of the Amador County Library contributed $2300.00 toward the purchase of new shelving as part of the project to completely remodel the Ione branch library. 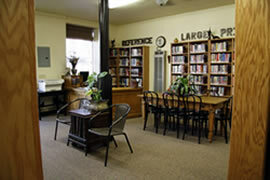 The Library is located in the Native Sons of the Golden West building. 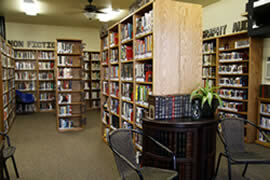 The Ione Rotary Club took on the total remodel. There was much community support and volunteer labor. Friends of the Amador County Library recently completed a year-long campaign to raise funds to replace antiquated shelving in the main library in Jackson. The Friends raised $38,600 through grants and private donations. As a result, modern, versatile shelving has been installed in the children, teen and adult non-fiction areas of the Jackson library, making books and audio-visual materials much more accessible and inviting. Over the past several years the Friends have contributed $4000.00 to each branch for additions to the children's collection, new fiction and non-fiction. 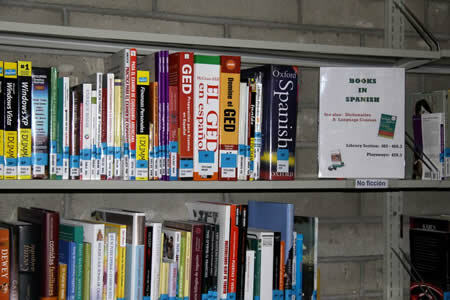 Each branch has also had funds put towards the Summer Reading program for events, supplies, etc.